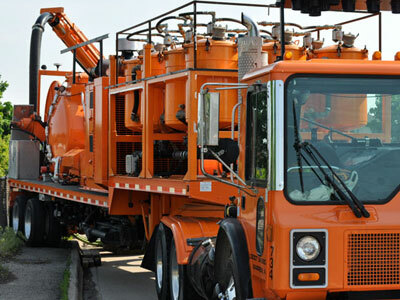 With over a century of environmental solutions, Doetsch Environmental Services has engineered and manufactured the equipment necessary to tackle the most difficult of all cleaning operations - Large Diameter Sewer Cleaning. While we have been successful with conventional sewer cleaning equipment, it was necessary for new innovations for performing large diameter or large bore sewer cleaning operations. Increased water flows are required for cleaning sewers greater than 36 inches in diameter. With this successfully handled, innovation did not stop. This whole process can be utilized in live sewer conditions, without the need for by-pass pumping. Most importantly, exercising environmental responsibility, this entire operation utilizes recycled sewer water for cleaning operations. Large diameter sewers were often overlooked and subsequently forgotten about because an efficient method of cleaning did not exist. Previous methods were slow, laborious and often very dangerous. 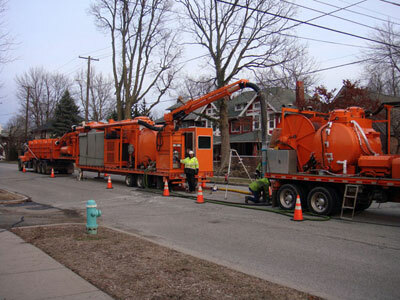 By utilizing 113 plus years of knowledge, passed down through five generations of sewer cleaning experience, Doetsch Environmental Services has innovated an advanced system necessary for safe, efficient and responsible Large Diameter Sewer Cleaning. Large Diameter sewers, also known as interceptors or collection systems, are not only bigger than a standard small diameter sewer but require a totally different process for cleaning. Conventional cleaning equipment is very effective for smaller sewers. As the pipe graduates to a larger diameter size (greater than 36"), cleaning objectives can be insurmountable using traditional cleaning methods because of increased pipe flow, increased debris levels, increased pipe lengths and increased manhole depths. 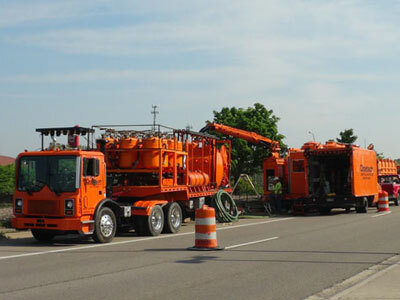 Utilizing custom-made, innovative and efficient cleaning equipment, Doetsch Environmental Services has conquered the process that plagued all sewer cleaning: effectively cleaning large diameter sewers. The two main elements to this solution are our custom-built HyJector and Grand Volumetric Recycler. Our process enables us to clean in all sewer conditions, to reclaim and continually recycle sewer water, vacuum continuously to prevent blow-by and continuously clean sewers up to 6,000' in length! As an industry leader, it is important to be environmentally responsible. That is why water recycling is such an important piece of this process. On average, Doetsch Environmental Services will consume in excess of 200,000 gallons of water per day. This would place an additional burden on the wastewater treatment plant if they were tasked with treating this increase in wastewater due to the cleaning. Or, if the municipality is under drought conditions, cleaning could prove costly because of the potable water consumed for cleaning. In Doetsch Environmental Services' process, wastewater (black water) and debris is vacuumed from the sewer. The debris is separated from the water, processed and packaged to be shipped to a disposal facility. The water is filtered several times and then used as jetting water. Without using neighborhood hydrants, complaints of "brown and contaminated" drinking water or the potential repairs that will be needed for the water main after usage related stressing, are eliminated. Efficiently recycling water not only saves Doetsch Environmental Services from wasting fresh water and residential complaints, it also enables us to clean an entire waste stream with no need to bypass pump, plug or shut the system down. By avoiding this, Doetsch Environmental Services is able to avoid costly backups or any other type of inconvenience to the residents, such as lengthy road closures due to a by-pass pipeline.